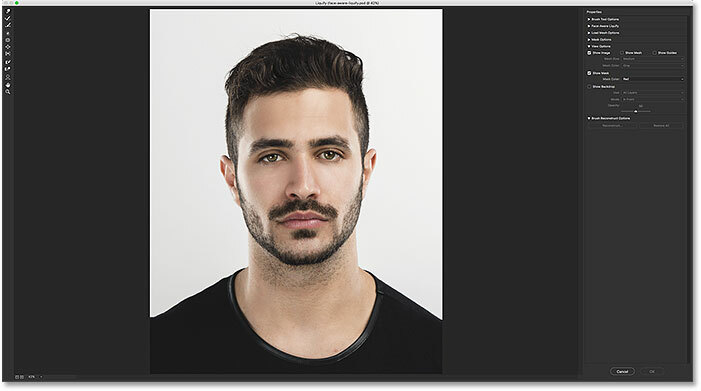 In this tutorial, we'll learn all about the new Face-Aware Liquify feature in Photoshop CC, which brings powerful face-detection capabilities to the Liquify filter, allowing us to easily reshape or distort a person's eyes, nose, mouth, and other facial features! 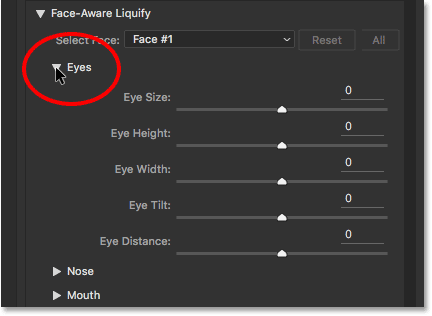 Face-Aware Liquify was first added to Photoshop CC as part of the June 2016 Creative Cloud updates, which, if you're keeping score, brought Photoshop CC up to version 2015.5. To use it, you'll need to be running Photoshop CC, and you'll want to make sure that your copy is up to date. There are two main parts to this new addition to the Liquify filter. 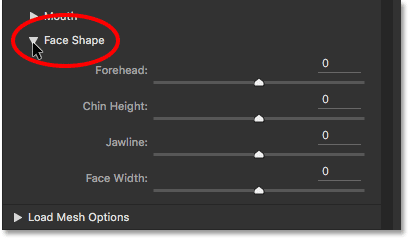 First, we have new Face-Aware Liquify sliders which make reshaping a face both simple and intuitive. There's sliders for adjusting the size, angle and distance of the eyes. Other sliders for adjusting the height and width of the nose. Still more sliders for reshaping the mouth (including a person's smile), and even more for things like raising or lowering the forehead and chin, expanding or contracting the jawline, and adjusting the width of the face. As we'll see, all of these things can now be done simply by dragging sliders left or right. The Liquify filter also gets a brand new Face Tool which allows us to control the sliders simply by clicking and dragging directly on the image itself. The Face Tool even lets us do things that we can't do with the sliders, like adjust the cheeks, reposition the nose, and even move a person's eyes in different directions! Once we've covered all there is to know about using Face-Aware Liquify, we'll finish up the tutorial by learning how to use it not only with a photo of a single person, but also with group shots, and how we can easily switch between multiple faces in a photo to select just the one we need. There's a whole lot to cover, so let's get started! 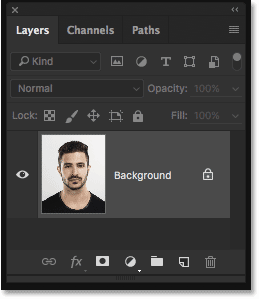 The Layers panel showing the photo on the Background layer. In a moment, I'm going to apply the Liquify filter to my image. But if we apply a filter directly to a normal layer in Photoshop, the filter will be applied as a static filter, which means we'll be making permanent changes to the image. A better way to work is to keep the filter settings fully editable, and we can do that simply by applying the filter not to a normal layer but to a Smart Object. Clicking the Layers panel menu icon. 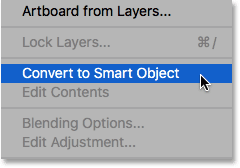 Selecting "Convert to Smart Object" from the list. The new Smart Object icon. Going to Filter > Liquify. The Liquify filter dialog box in Photoshop CC. The new Face-Aware Liquify section. Twirling open the Face-Aware Liquify section. The Eyes, Nose, Mouth, and Face Shape categories. The five sliders for the eyes (Size, Height, Width, Tilt, and Distance). 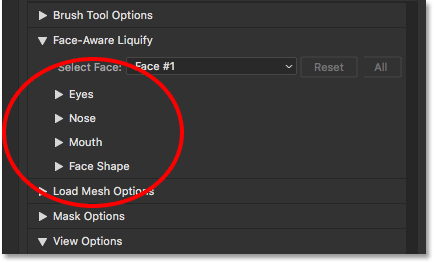 All of the sliders in the Face-Aware Liquify section, not just for the eyes but also for the nose, mouth, and face shape, share the same range of values. We can drag them toward the right to a maximum value of 100, or we can drag them toward the left to a maximum value of -100. Dragging a slider back to the center will reset it to 0. Of course, each slider controls a different aspect of the face, so let's see what each one does. 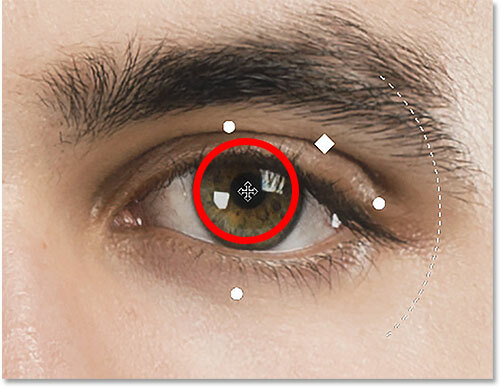 Dragging the Eye Size slider to the right. Dragging the Eye Size slider to the left. Here's a comparison showing the effect that each setting has on the image. I'll use a similar comparison for each of the sliders as we go along. The image in the center shows the slider in its default center position (with a value of 0, where it has no effect). The version on the left shows the result of the slider when dragged all the way to the left (to its maximum value of -100). The image on the right shows the effect with the slider dragged all the way to... you guessed it, the right (to its maximum value of +100). So, left image = slider left; center image = slider center; right image = slider right. Eye Size = -100 (left); Eye Size = 0 (center); Eye Size = +100 (right). Eye Height = -100 (left); Eye Height = 0 (center); Eye Height = +100 (right). Eye Width = -100 (left); Eye Width = 0 (center); Eye Width = +100 (right). Eye Tilt = -100 (left); Eye Tilt = 0 (center); Eye Tilt = +100 (right). Eye Distance = -100 (left); Eye Distance = 0 (center); Eye Distance = +100 (right). The two sliders for adjusting the nose (Height and Width). Nose Height = -100 (left); Nose Height = 0 (center); Nose Height = +100 (right). 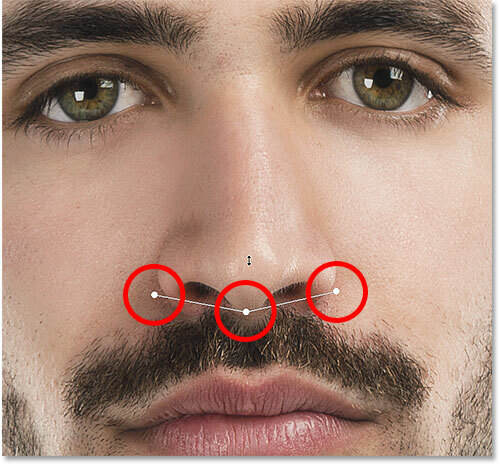 Nose Width = -100 (left); Nose Width = 0 (center); Nose Width = +100 (right). 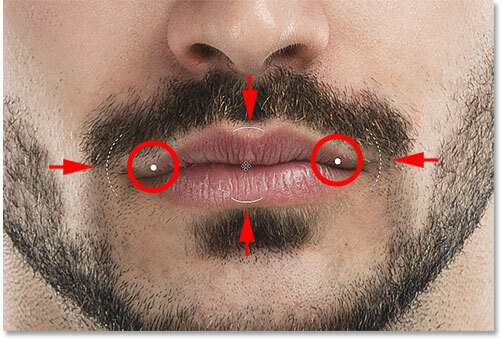 The five sliders for the mouth (Smile, Upper Lip, Lower Lip, Mouth Width, Mouth Height). Smile = -100 (left); Smile = 0 (center); Smile = +100 (right). 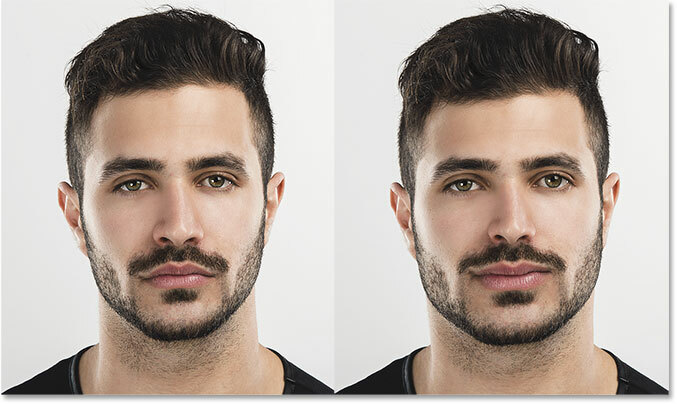 Upper Lip = -100 (left); Upper Lip = 0 (center); Upper Lip = +100 (right). Lower Lip = -100 (left); Lower Lip = 0 (center); Lower Lip = +100 (right). Mouth Width = -100 (left); Mouth Width = 0 (center); Mouth Width = +100 (right). 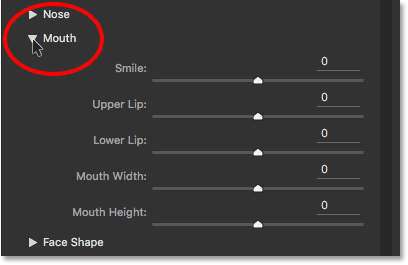 Mouth Height = -100 (left); Mouth Height = 0 (center); Mouth Height = +100 (right). 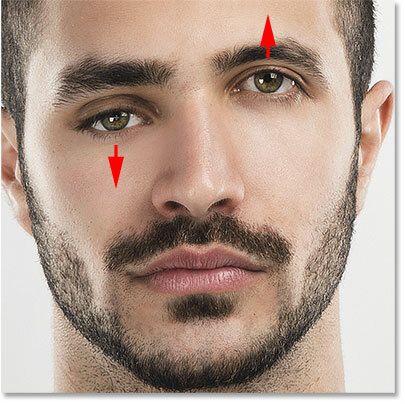 The four sliders for the face shape (Forehead, Chin Height, Jawline, and Face Width). Forehead = -100 (left); Forehead = 0 (center); Forehead = +100 (right). Chin Height = -100 (left); Chin Height = 0 (center); Chin Height = +100 (right). 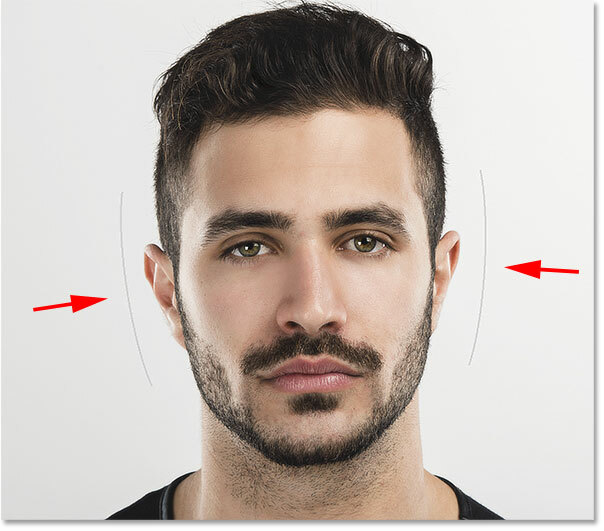 Jawline = -100 (left); Jawline = 0 (center); Jawline = +100 (right). 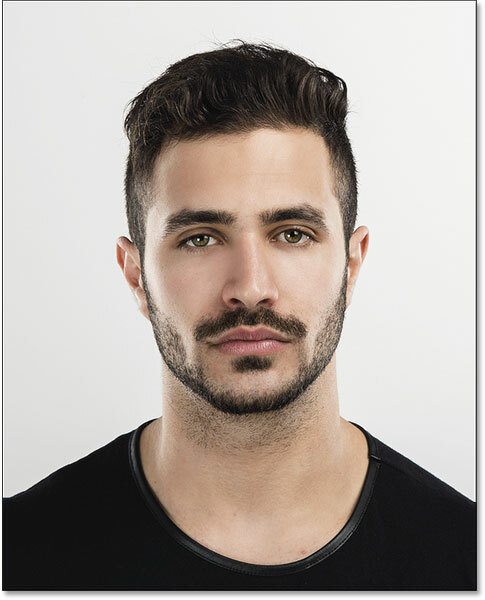 Face Width = -100 (left); Face Width = 0 (center); Face Width = +100 (right). 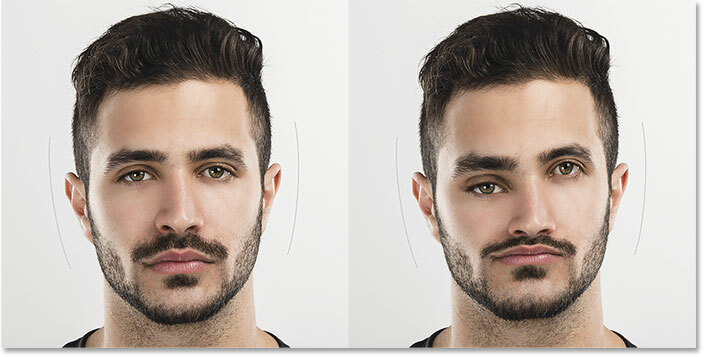 The main purpose of the Face-Aware Liquify sliders is to correct unwanted distortions in an image that are causing someone to look different from how they appear in real life. But the sliders can just as easily be used to make a person look like someone else entirely! A before (left) and after (right) comparison. 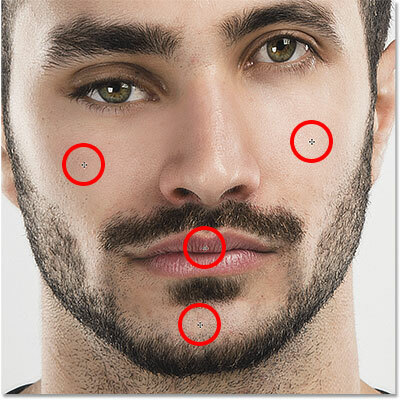 Photoshop outlines the targeted face, even when it's the only face. The reason we learned about the sliders before looking at the Face Tool is that the Face Tool really just gives us another way to adjust the sliders. The difference is, rather than dragging the sliders themselves, the Face Tool lets us click and drag directly on the image. Handles appear around the eye when hovering over it with the Face Tool. Dragging the Eye Height handle moves the Eye Height slider. The round handle on the side is linked to the Eye Width slider. The diamond-shaped handle in the upper corner controls the Eye Size slider. And if we click and drag on the curved dotted line along the outer edge, we move the Eye Tilt slider. 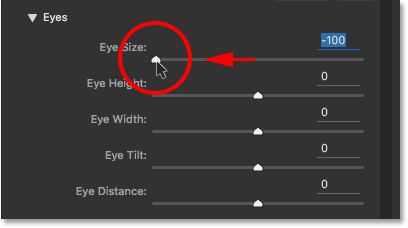 If you have Tool Tips enabled in Photoshop's Preferences, you can hover your cursor over each handle and the name of its matching slider will appear. 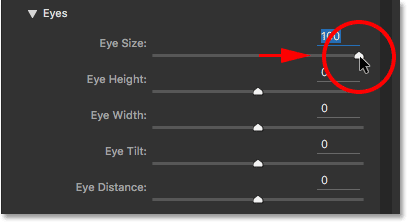 The only slider that does not have a handle associated with it is Eye Distance. Dragging the Eye Tilt handle moves the Eye Tilt slider. The Nose Width (left and right) and Nose Height (bottom) handles. The various Mouth property handles. Another example of how the handles and sliders are linked together. The real benefit of the Face Tool is that, along with being able to adjust the sliders by dragging directly on the image, it also opens up additional areas that we can adjust; areas that are not accessible with the sliders. But this is also where things can get weird pretty quickly. 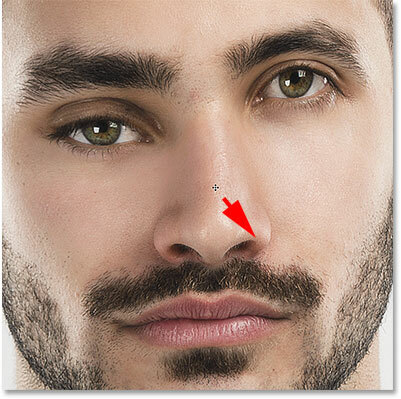 Hovering over certain areas turns the Face Tool cursor into a directional arrow. Dragging one eye up and the other eye down, just because we can. Dragging the nose with the Face Tool. Lookin' good. The cheeks, mouth and chin can be moved just like the eyes and nose. How to impress absolutely no one with Face-Aware Liquify. Way back at the beginning of the tutorial, before we even applied the Liquify filter, we first converted our image into a Smart Object. We did that so we could apply Liquify as an editable Smart Filter. Now that we've applied our settings and closed out of the Liquify dialog box, if we look in the Layers panel, we see Liquify listed as a Smart Filter below the image. 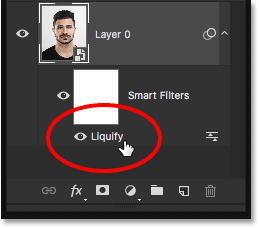 Double-clicking on the Liquify Smart Filter in the Layers panel. Editing the Face-Aware Liquify settings thanks to the power of Smart Filters. At this point, we've covered everything we need to know about using the new Face-Aware Liquify feature in Photoshop. We've learned how to adjust the eyes, nose, mouth and overall face shape using the various sliders in the Properties panel. We've also learned how to adjust the same sliders by clicking and dragging directly on the image with the Face Tool, and how we can use the Face Tool to freely move and reshape other areas as well. Face-Aware Liquify works just as well with group shots. 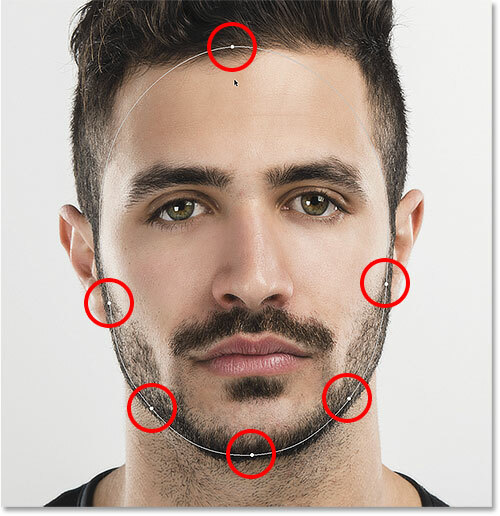 Photoshop draws outlines around each face it detects in the photo. Five people in the photo, five faces in the list. 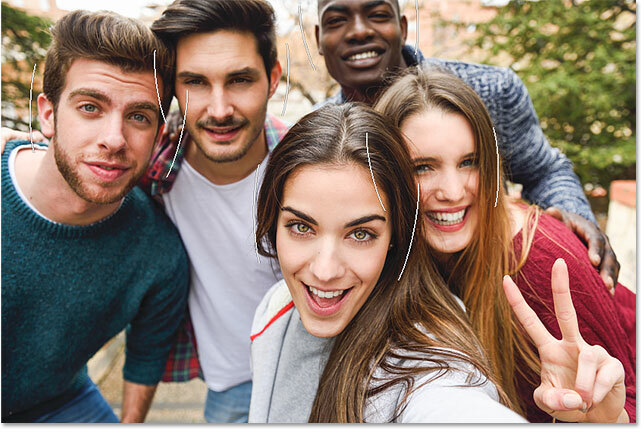 Clicking on the woman in the center with the Face Tool. Selecting the woman in the center by clicking on her with the Face Tool. Click Reset to undo changes to a single face, or All to reset all faces at once. And there we have it! That's our complete look at how to use the brand new Face-Aware Liquify feature, part of the June 2016 Creative Cloud updates for Photoshop CC! 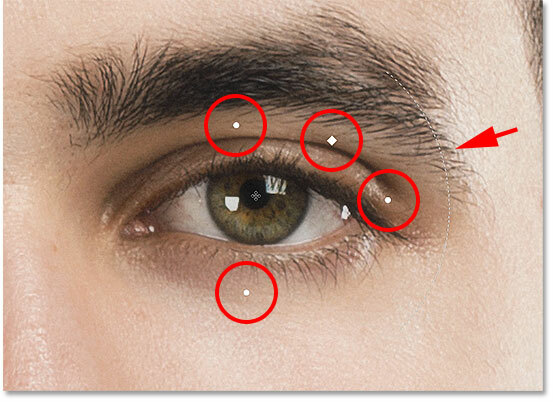 Check out our Photo Retouching section for more image editing tutorials!